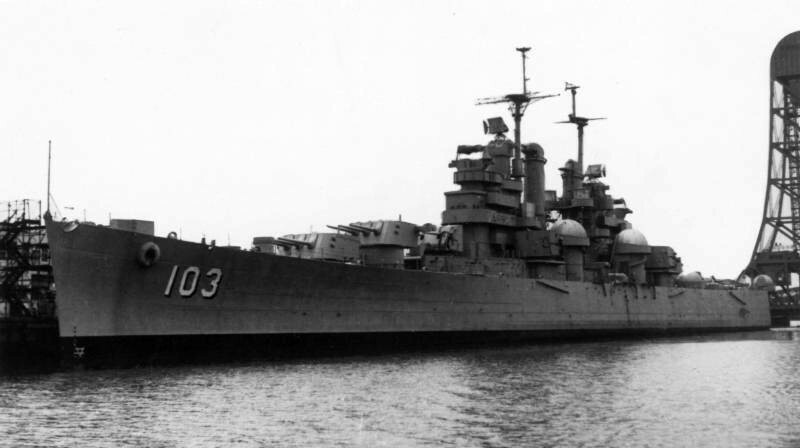 Fate: Sunk during underwater explosive tests on 12/13 MAY 1972 off the Florida Keys. 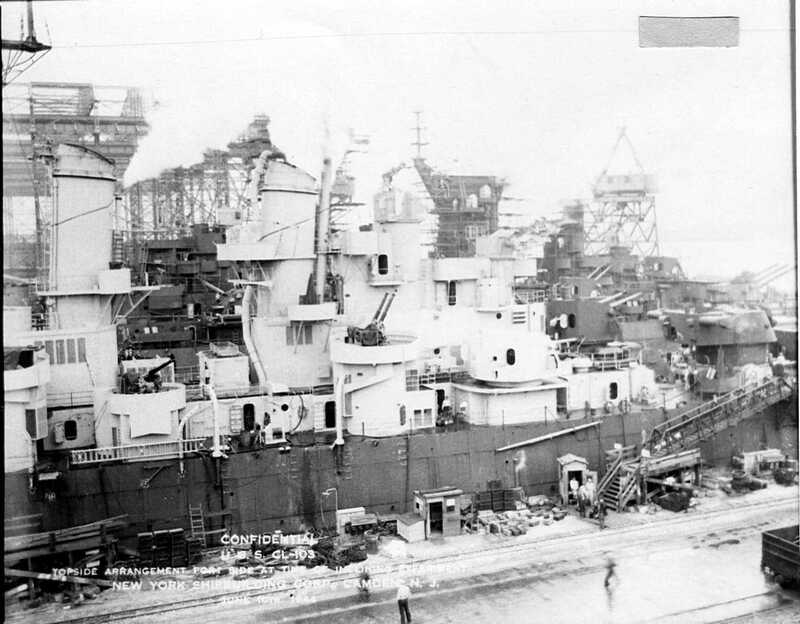 Port side view just after slipping down the ways, 24 DEC 1943. 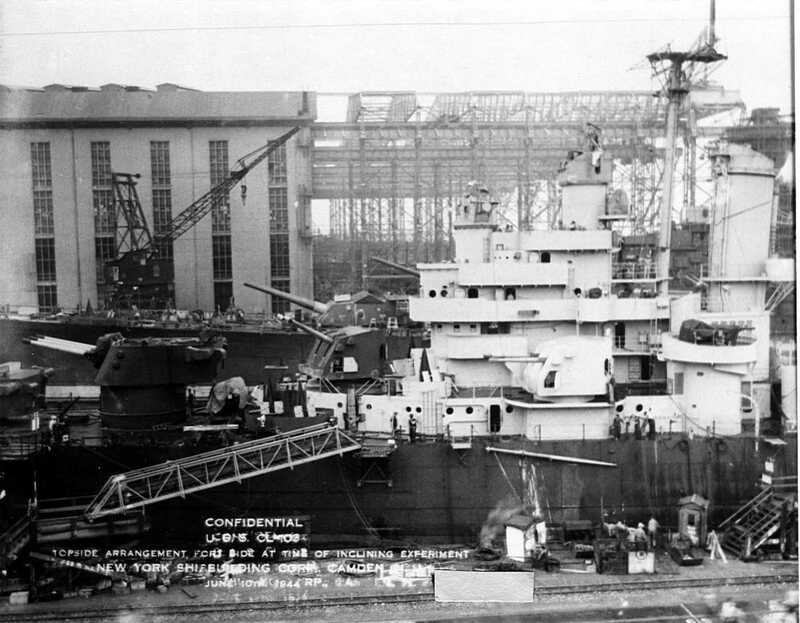 Port bow view while undergoing Inclining prior to commissioning at New York Shipbuilding, 10 June 1944. The Guam (CB 2) can be seen in the background. 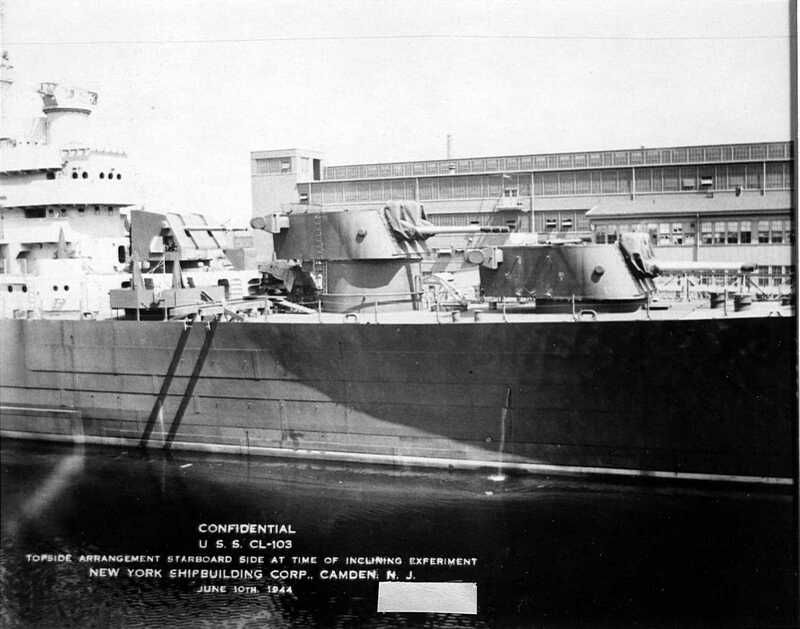 Port side aft view while undergoing Inclining prior to commissioning at New York Shipbuilding, 10 June 1944. 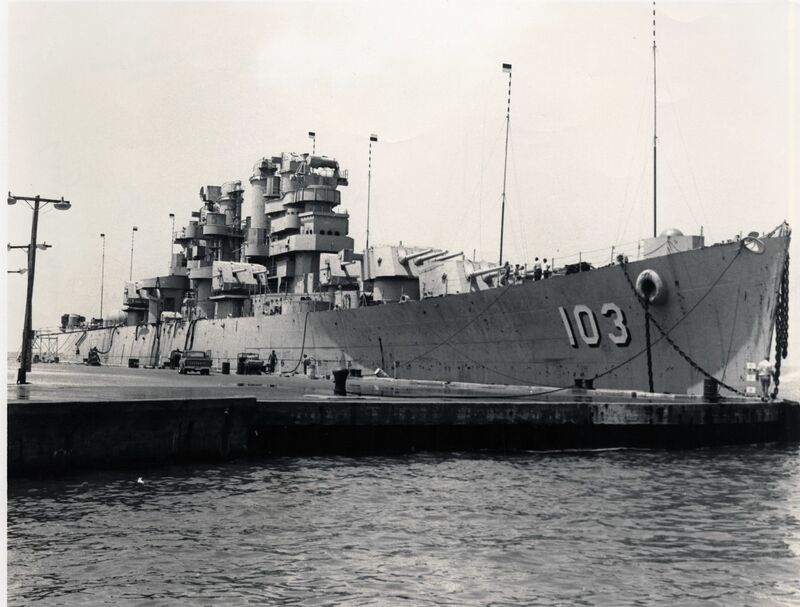 The Guam (CB 2) can be seen in the background. 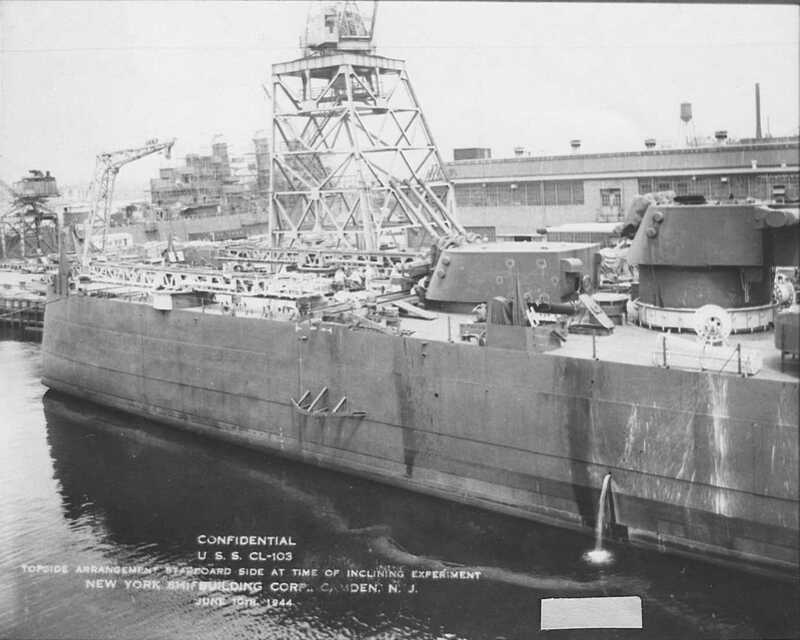 Port side view of forward deckhouse while undergoing Inclining prior to commissioning at New York Shipbuilding, 10 June 1944. 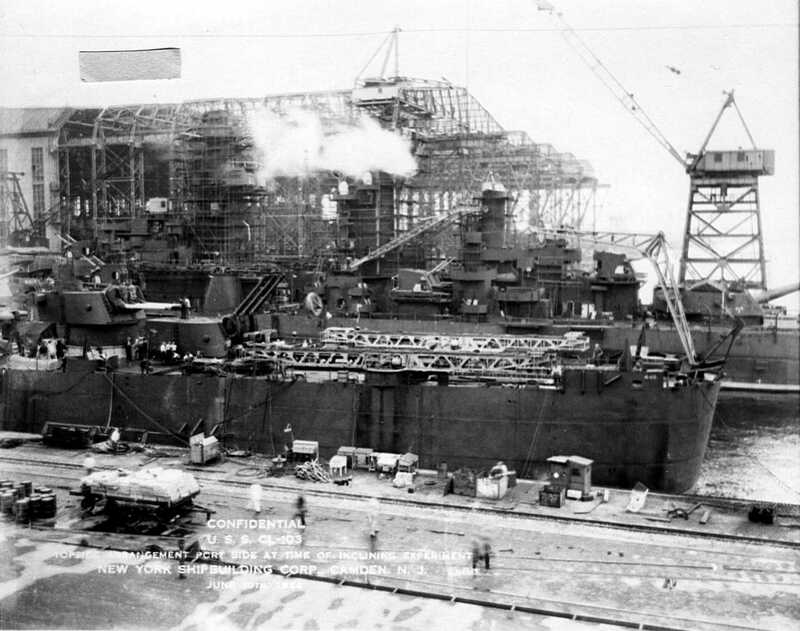 The Guam (CB 2) can be seen in the background. 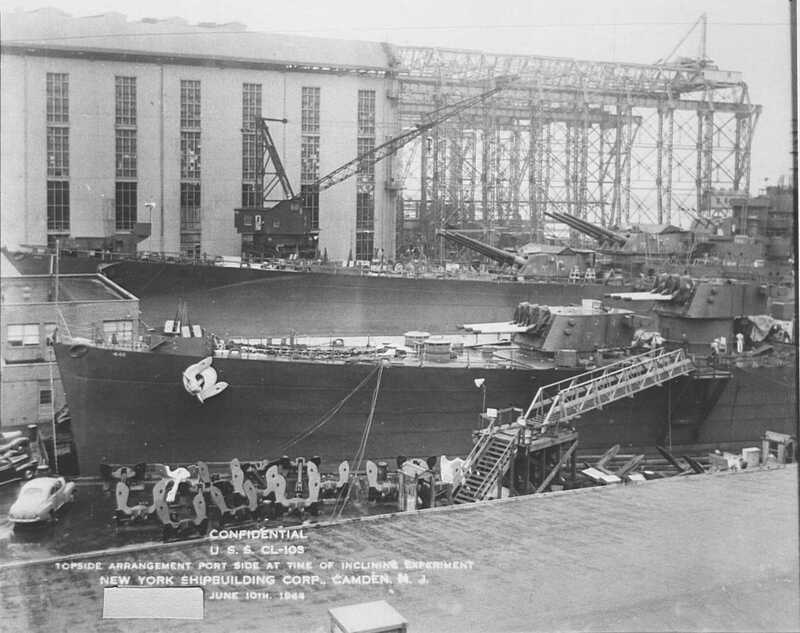 Port side view of aft deckhouse while undergoing Inclining prior to commissioning at New York Shipbuilding, 10 June 1944. 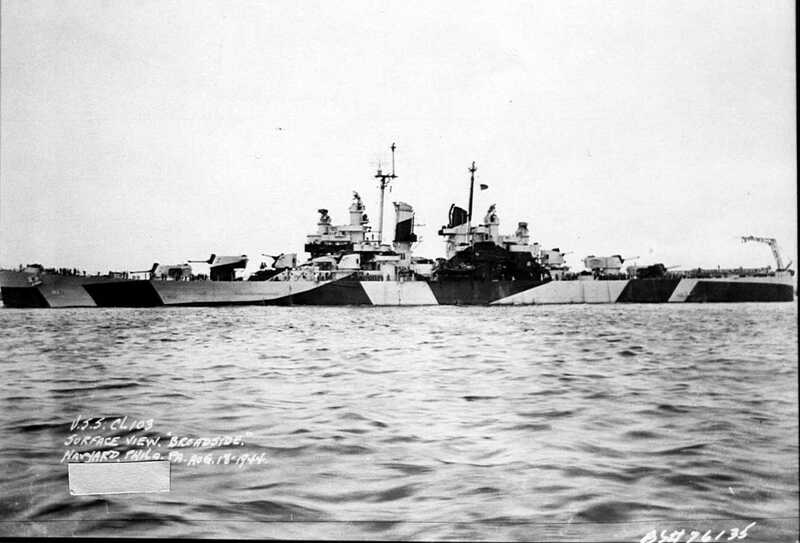 The Guam (CB 2) can be seen in the background. 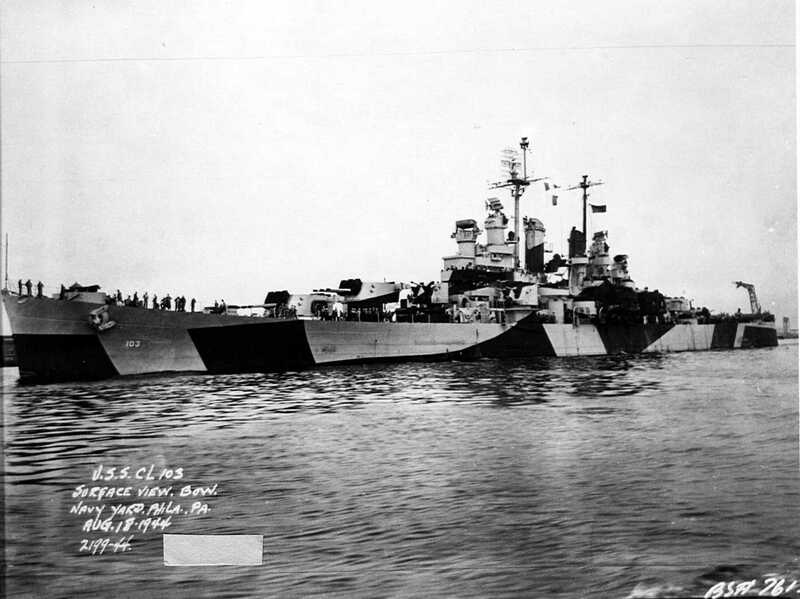 One of Wilkes-Barre's starboard twin 40mm mounts and crew at the ready in February or March of 1945. 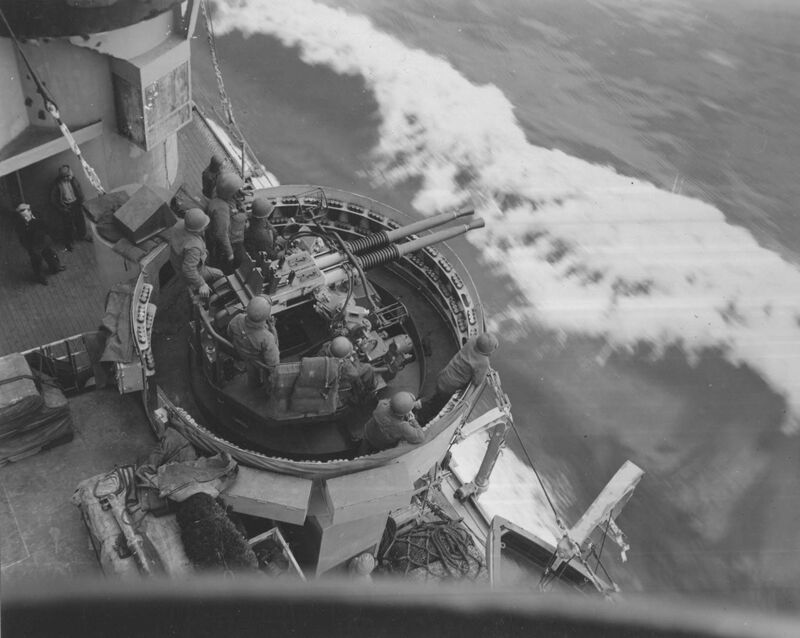 Note the Ready Service Ammunition ringing the tub bulkhead. 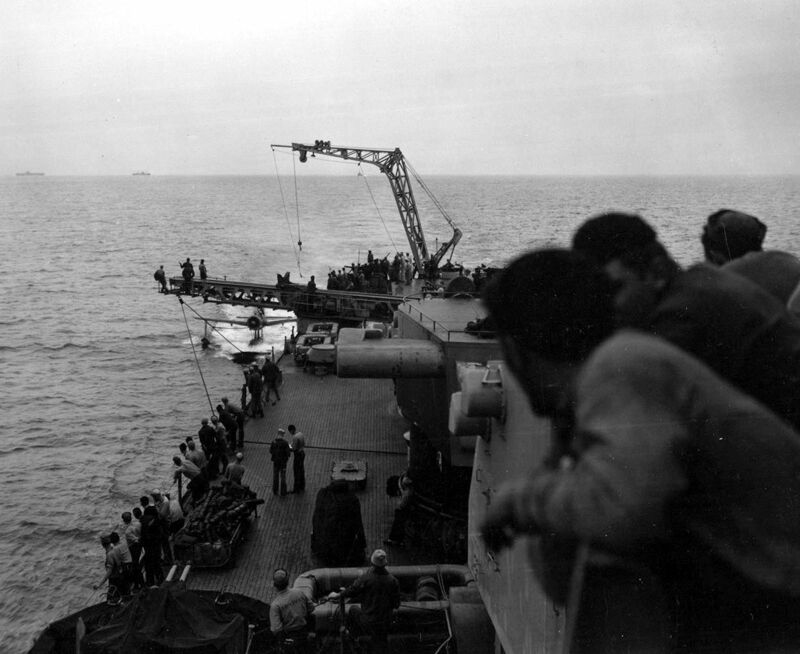 Wilkes-Barre's crew has swung her starboard airplane catapult out to aid in recovery of one of her OS2U Kingfisher scout aircraft. The recovery sled line is run up to a pulley hanging off the aft end of the catapult and then to a roller chock at deck edge and then to a winch aft of her after 6" mount. Photo dated February/March of 1945. 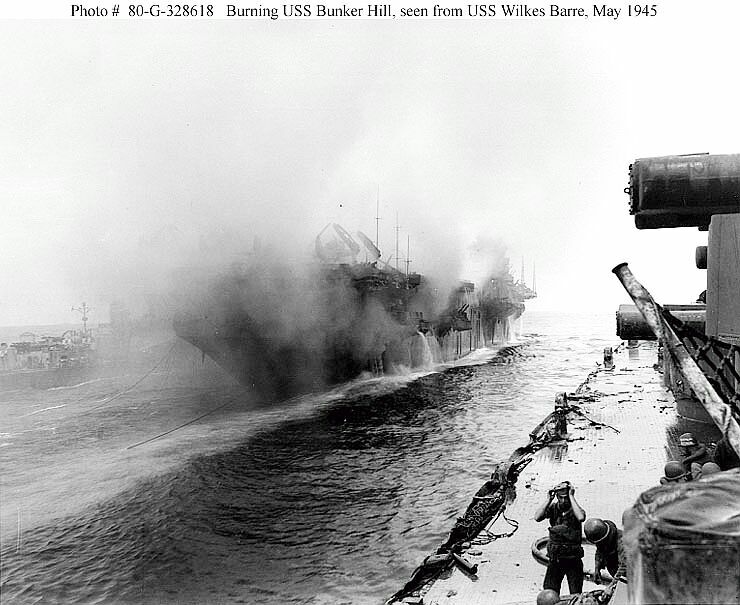 USS Bunker Hill (CV 17) burning after being hit by a "Kamikaze" attack while operating off Okinawa on 11 May 1945. 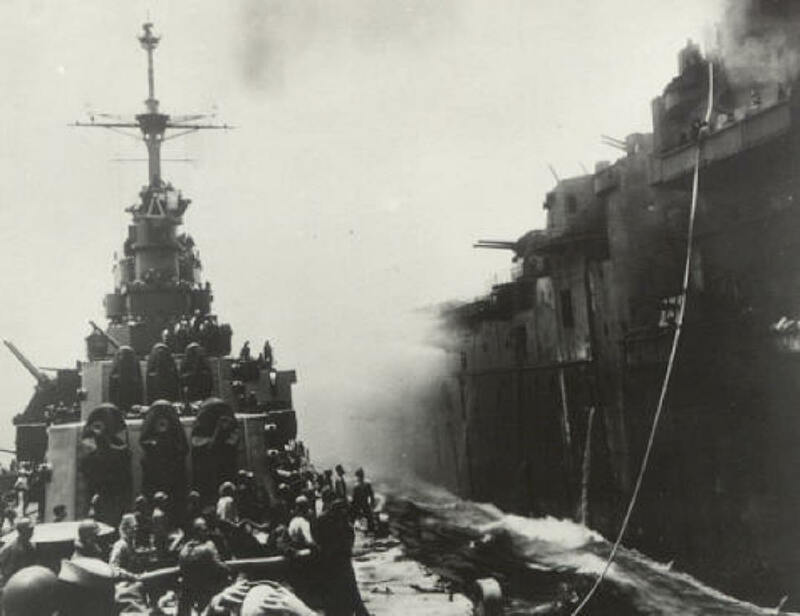 Photographed from USS Wilkes Barre (CL 103), which appears to have received fire damage herself helping to fight the blaze from alongside the carrier. A destroyer is off Bunker Hill's port side. Official U.S. Navy Photograph, now in the collections of the National Archives # 80-G-328618. 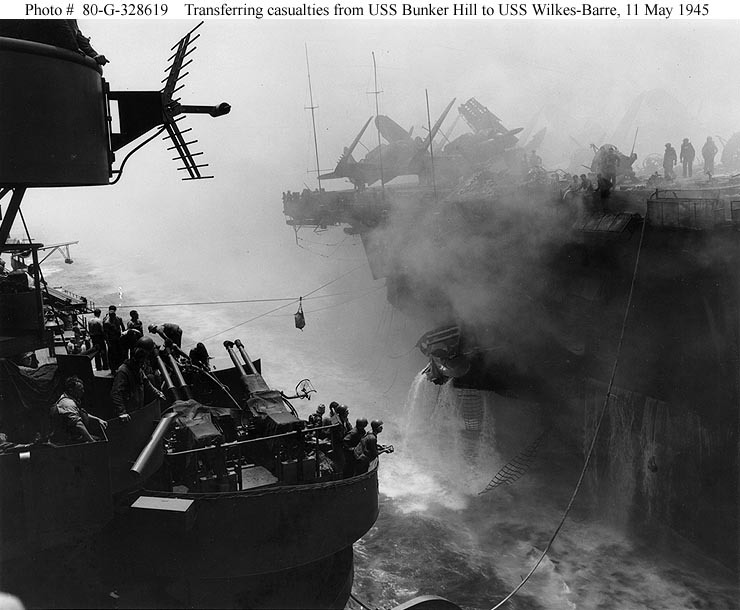 USS Bunker Hill (CV 17) casualties from Kamikaze hits are transferred to USS Wilkes-Barre (CL 103) for medical care, off Okinawa on 11 May 1945. Photographed from Wilkes-Barre's port side amidships, looking aft. 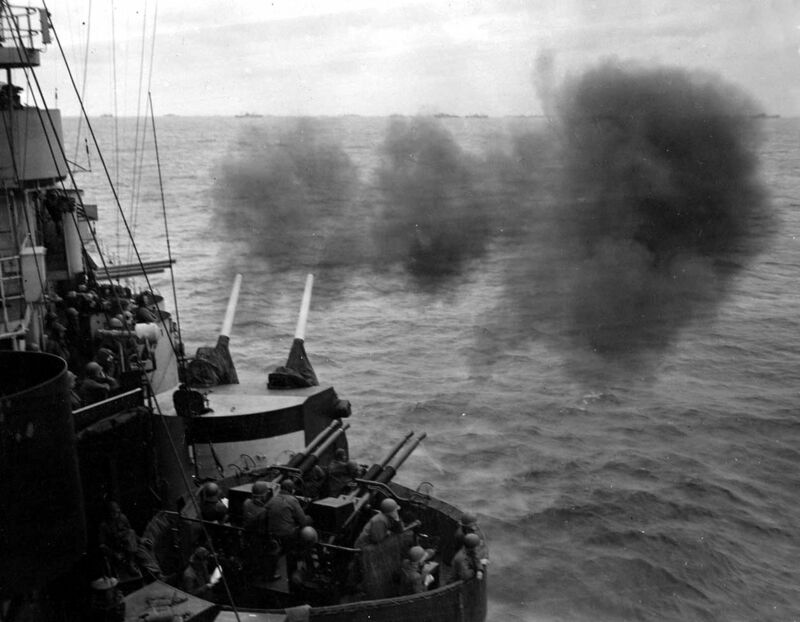 Note SB2C aircraft (one with a burned wing) parked aft on Bunker Hill, smashed 40mm gun position on her starboard side, smoke from still-burning fires, and firefighting water streaming over her side. 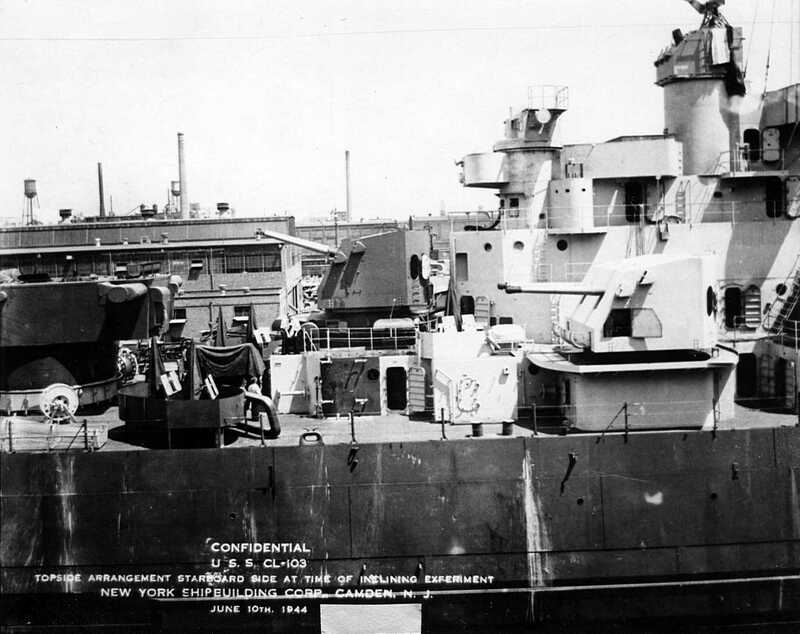 On Wilkes-Barre note the 40mm quad gun mount in the foreground and the electronic antenna above. 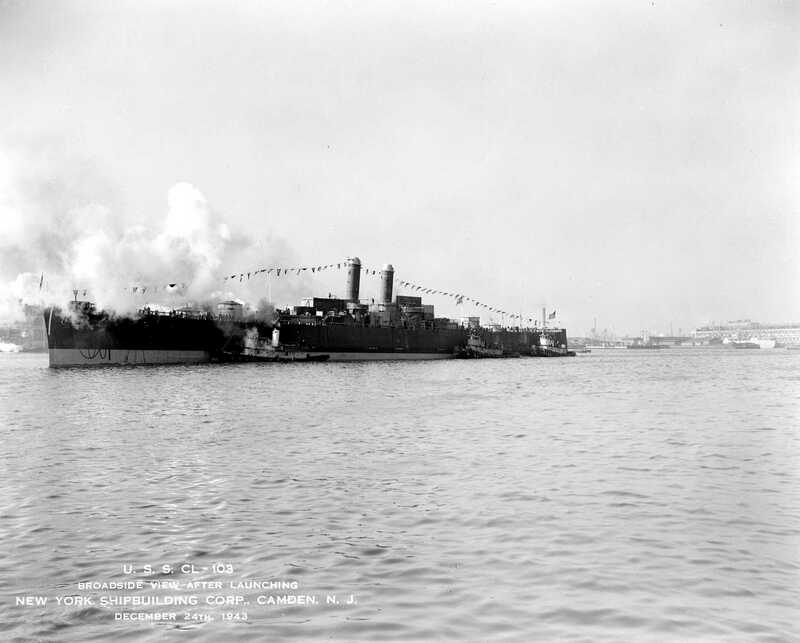 Official U.S. Navy Photograph, now in the collections of the National Archives # 80-G-328619. 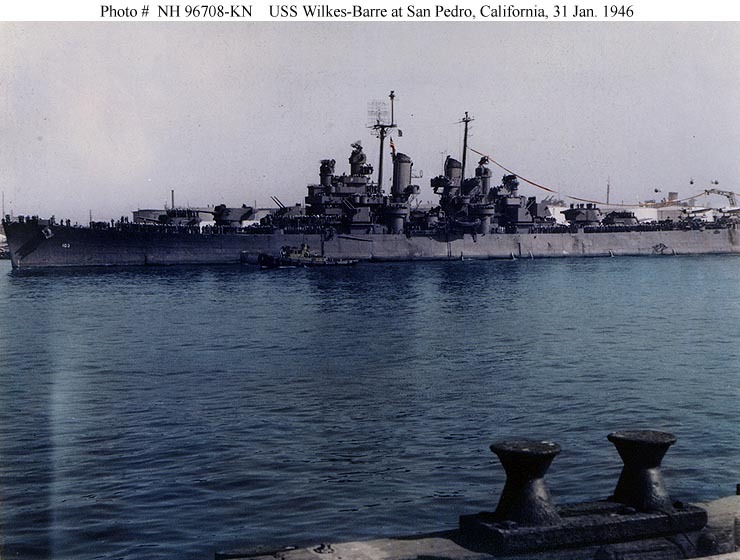 USS Wilkes-Barre (CL 103) Color-tinted photograph of the ship at San Pedro, California, 31 January 1946, upon her return from wartime service in the western Pacific. Note the homeward bound pennant held up by balloons. Courtesy of Captain Edwin C. Finney, USN (Retired), 1991. U.S. Naval Historical Center Photograph #NH 96708-KN. 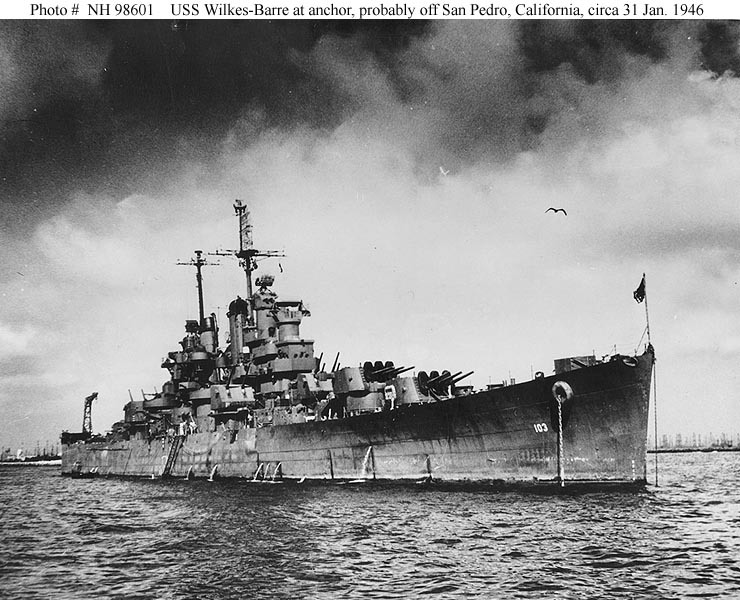 USS Wilkes-Barre (CL 103) At anchor, probably at San Pedro, California, circa 31 January 1946. Donation of Commander Reo E. Nicar, USNR (Retired), April 1978. U.S. Naval Historical Center Photograph #NH 98601. 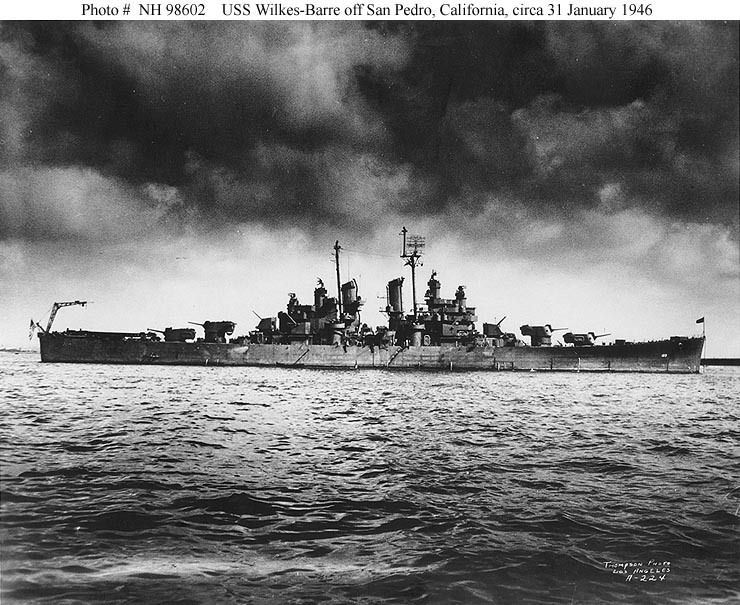 USS Wilkes-Barre (CL 103) Off San Pedro, California, circa 31 January 1946. Photographed by Thompson, Los Angles, California. Donation of Commander Reo E. Nicar, USNR (Retired), April 1978. U.S. Naval Historical Center Photograph #NH 98602. 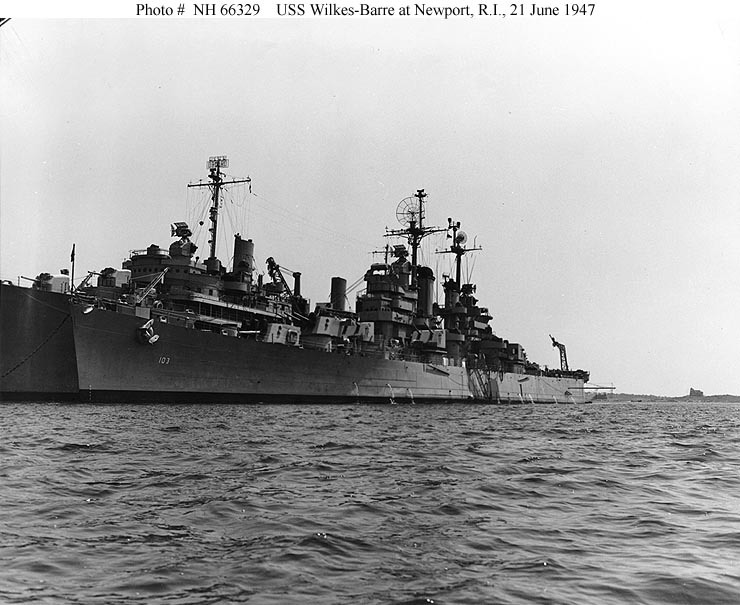 USS Wilkes-Barre (CL 103) Alongside a destroyer tender, at Newport, Rhode Island, 21 June 1947. Courtesy of the Mariners' Museum, Newport News, Virginia. Ted Stone Collection. U.S. Naval Historical Center Photograph #NH 66329. 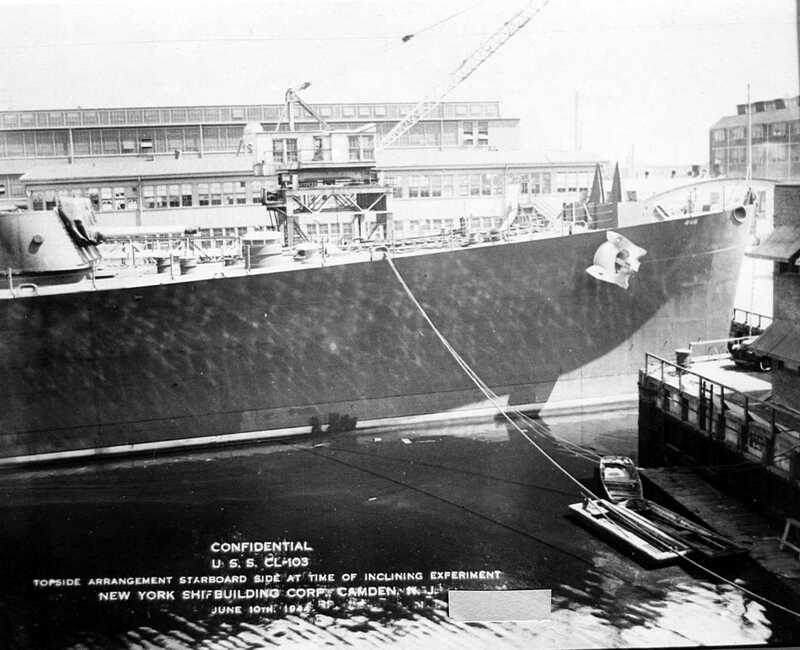 Port bow view, Moored in Philadelphia, PA with the Atlantic Reserve Fleet, 1971. From the collection of the Naval Record Club. ex-USS Wilkes Barre (CL 103) at the outer mole of the Naval Station before she was sunk as an artificial reef off Key West in April 1972. From the Ida Woodward Barron Collection. Florida Keys Public Libraries photo #MM00007227. 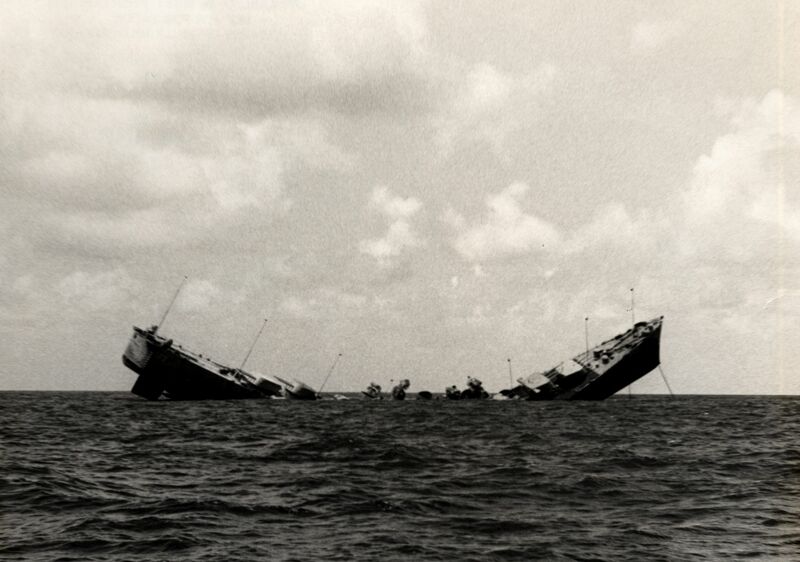 ex-USS Wilkes Barre (CL 103) being sunk for an artificial reef off Key West in April 1972. From the Ida Woodward Barron Collection. Florida Keys Public Libraries photo #MM00007973.